Box Insides Have Closed Edge Area With Reflective Film For Provent The Light Emit And Make More Bright. Totorola Cellphone Retail Store Signs for Branding presentation. Signs that are inside of buildings have to be built with much more attention to detail than the ones that are located in outdoor shopping areas. The storefront signs inside malls are normally designed smaller than the signs outside. 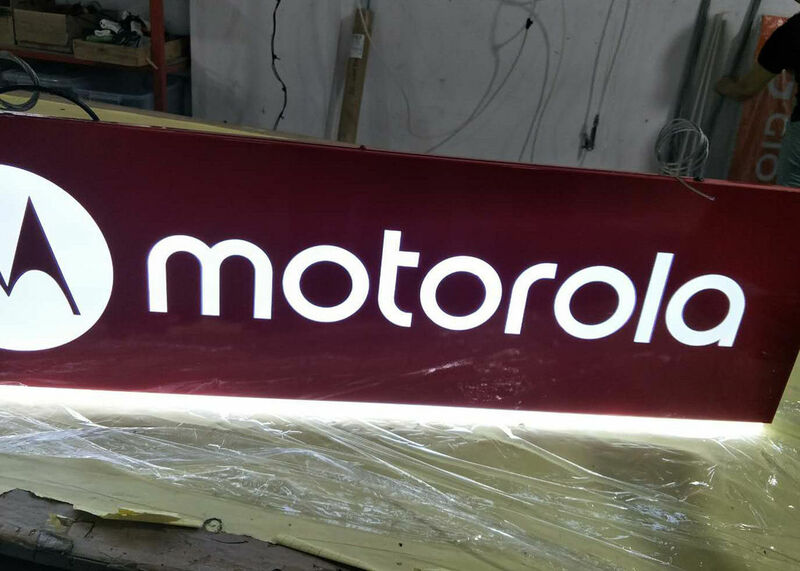 The Motorola haning sign is design for the cellphone store to underline their brand and let the visitor knowing here have this brand cellphone for sell , just coming the store for further information. Lighting system:Inside firmly bonded with 3mm milk white acrylic sheet lighted crystal-like viewing to get more attention..Logo outside look with hollow 3D effect, Interior high bright LED strip as light source. CE or UL transformer can be option.The transfomer bulid insides to save electricity installation trouble. Hanging system: 2 pcs 60cm length metal tube with iron rope for ceiling hanging. Ceiling hanging hardware included for a ready-to-install fixture. Dual-sided display for highly visible signs from both directions. Includes 24" length pre-attached cable wire which can be adjusted for businesses to place at the best height. It is the best sign for all kinds of specialty stores to light up famous brand to attract view coming in and start the shopping.